Through seven years of writing his second novel, a historical tale woven through Cuba, Tampa, and revolution, Mark Carlos McGinty had a faithful companion. That’s only appropriate. 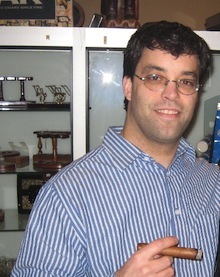 His book is, after all, titled The Cigar Maker. It’s filled with the sights and sounds of turn-of-the-20th-century Tampa when it was truly Cigar City. Drawing from his own family’s past as well as historical events, McGinty artfully spins a story that is both exciting and educational. His mother’s family was among those in Tampa, and McGinty spent quite a bit of time there with relatives when he was growing up. Her books about the area and Cuba inspired him. The main characters in The Cigar Maker, Salvador and Olympia Ortiz, are modeled on McGinty’s maternal grandparents. McGinty’s parents are now retired in Tampa, and he visited frequently researching the book. The book has another family connection, too. McGinty’s wife did the striking cover illustration, a cigar-smoking rooster wearing a derby and striding across a tobacco plantation. The rooster made such an impression that it’s now available on mugs, T-shirts, and other items. Tampa is the site of a new promotional push for The Cigar Maker, with efforts to get it featured in Ybor City shops. McGinty’s also targeting cigar smokers as a natural audience at B&M events like his recent appearance at Perfect Ash, just outside Minneapolis-St. Paul. He’s most excited about an upcoming trip to Havana. He and his wife are part of a sanctioned delegation of artists and writers slated to visit in February. While I think just about anyone will enjoy The Cigar Maker, cigar smokers in particular should find it fascinating. You can order it from McGinty’s website, Amazon, or just about any bookstore. Numerous e-reader versions are available at Smashwords. 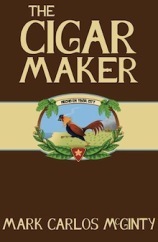 I enjoyed reading 'The Cigar Maker'. I felt I was right there in Ybor City with the characters in the book. Hi Stogie Guys – thanks for a great piece. Just wanted to let everyone know that on 12/28 "The Cigar Maker" was announced as a winner at the New England Book Festival, Honorable Mention in the General Fiction category. Here is a link with all the winners!